Paul Schrader is one of the unsung members of the Spielberg/Scorsese/Coppola “movie brat” generation of filmmakers. 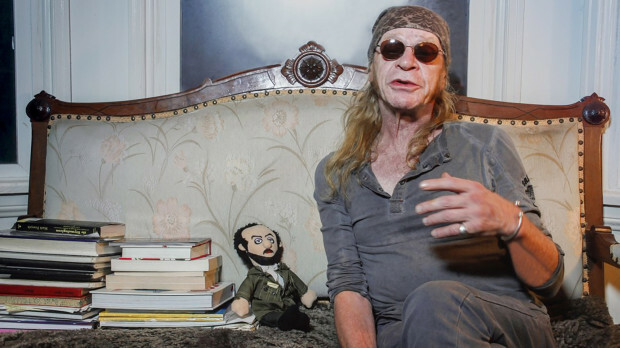 He’s hardly a household name, but he’s had a hand in some of the most important movies in film history, both as a writer (Taxi Driver, Raging Bull) and as a director (American Gigolo, Cat People). His newest movie, which he both wrote and directed, is the personal passion project First Reformed. 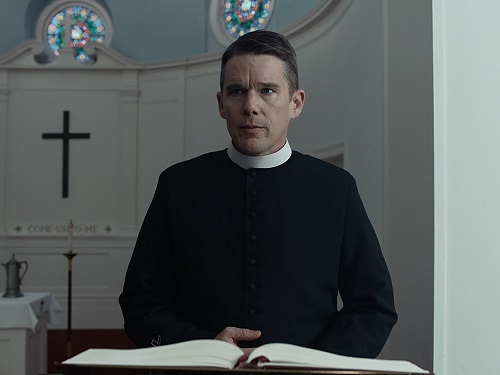 First Reformed is about a pastor named Reverend Ernst Toller (Boyhood‘s Ethan Hawke) whose small First Reformed Church is preparing to celebrate its 250th anniversary. Having been usurped by a parent megachurch called Abundant Life that is run by an uncompassionate man named Pastor Jeffers (Cedric Kyles, better known as comedian Cedric the Entertainer), First Reformed has pretty much been relegated to being a tourist attraction, with Reverend Toller seen as more of a symbolic figurehead than anything else. 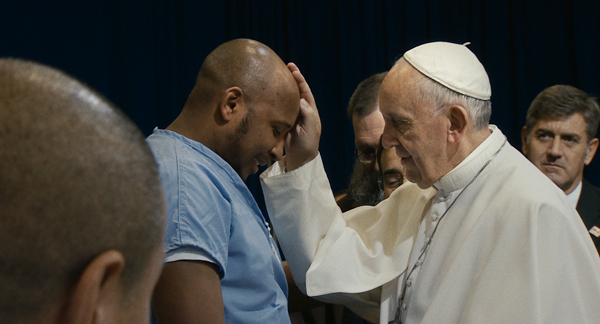 One of Toller’s parishioners, a pregnant woman named Mary (Amanda Seyfried from Ted 2), asks him to talk with her husband, an environmental activist named Michael (Compliance‘s Philip Ettinger) who is experiencing doubts about bringing a child into the polluted and dying world. Events from his past coupled with the uncaring nature of his parent church already have his resolve on shaky ground, so Toller’s conversation with the young man about the fate of the Earth drives the pastor to a full-on crisis of faith. First Reformed is a powerful film. The main theme is one of science vs. religion, with Reverend Toller’s religious side blinking first. Schrader’s storytelling is in top form as he explores both sides of the issue, but he does seem to have more problems with the blind faith of the spiritual side, as First Reformed is critical of both the money-hungry megachurch explosion as well as of the church’s blindness and deafness to modern ecological issues. And Schrader’s point of view is emphasized by Ethan Hawke’s first-rate performance as the sensitive-yet-conflicted old-soul reverend. 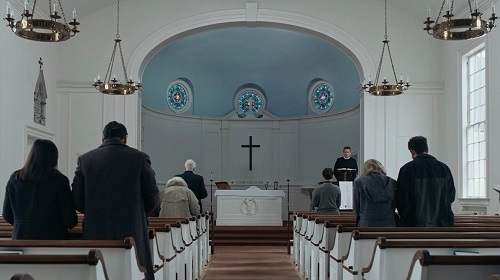 Once First Reformed gets rolling, it progresses like a slow moving conveyor belt that holds the audience captive, showing them where they’re going, but not letting them get off the ride or even look away from the carnage. The ending cops out a bit, as it is actually three endings in one, as if Schrader had a bunch of great ideas and didn’t want to lose any of them, and frankly, the ultimate ending is the least satisfying of the three. That’s a controversial opinion, I know, and a difficult one to defend without spoiling anything. Since First Reformed is a great movie, you should see it anyway, and make up your own mind about the conclusion. After writing all of that, I listened to the A24 Podcast in which Paul Schrader and Sofia Coppola discuss the ending of First Reformed (it’s a good listen, but see the movie first, as it’s spoiler-ific). While Schrader’s explanation (or lack thereof) muddies the waters even more, he makes his intentions with the sequence clear, so although I may still be dissatisfied, I have come to terms with it. Paul Schrader knows what he’s doing, even if the rest of us don’t. First Reformed was photographed by Alexander Dynan, who shot Schrader’s last movie, Dog Eat Dog, but otherwise has mostly documentary features like The Wolfpack to his credit. 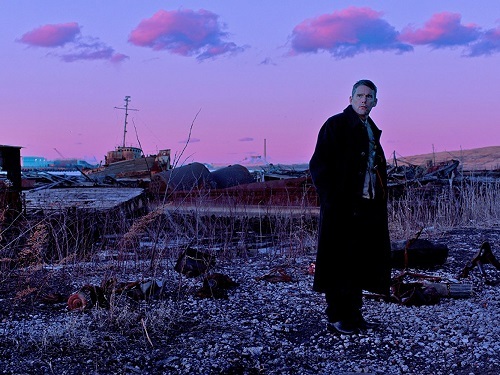 Dynan shoots First Reformed in a realistic style that still manages to be beautiful, capturing his subjects both in lush long shots and sterile close-ups, seemingly to juxtapose the conflict that exists inside Toller’s mind. The interesting camera angles force the viewer to concentrate their attention on the outsides of the 4:3 aspect ratio frame, and the long, drawn out takes allow characters to come in and out of the shot in a slowly shifting and sliding way. Think of the scenes in Rosemary’s Baby in which things are happening just off screen so that the viewer wishes that they could pan the camera themselves to see what’s going on, and that’s the same effect that’s on display in First Reformed. It’s a masterful technique when used correctly, and Dynan absolutely uses it correctly.